This specific solution includes TAWIGrip vacuum yoke installed on a hoist. The yoke is equipped with six adjustable suction cups and can be used to lift, tilt and rotate sheets in 90° position. Click here to view video. The handle is ergonomically designed and fully integrated with the hoist. The operator can simply use the controls on the handle to maneuver every movement; activate vacuum, lift up/down, control the vacuum level and release the load. This contributes to easy operation, good ergonomics and increased safety. 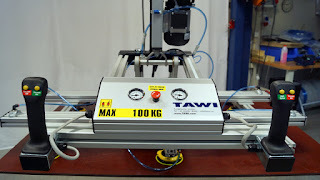 Click here for more information about our different TAWIGrip lifting solutions. ViperHoist is our latest product edition at TAWI and it is one of the world´s fastest hoists. The wire hoist is available in two models, one for quick lifting up to 60 kg and one model for heavier lifting up to120 kg. In this project, ViperHoist wire hoist equipped with pneumatic clamping tool is used for lifting car batteries weighing up to 60 kg. The tool is operated with controls on the handles, clamping the battery from two sides. The hoist is equipped with a one handed pistol grip for up/down movement, providing flexible and safe operation. This ViperHoist is mounted on a Lyftman jib crane in aluminium and used in the packaging area when packing car batteries on to pallets. Our hoist offers good ergonomics, low energy consumption as well as easy, safe and flexible handling for all types of applications. By adding a quick coupling on the ViperHoist the operator can easily change tool on the hoist, thus using the same hoist to lift various types of goods. Reels, plastic containers and wooden pallets are some examples of goods that can be easily, safely and quickly handled with TAWI ViperHoist. Click here for more information about ViperHoist wire hoist. New ergonomic solution! 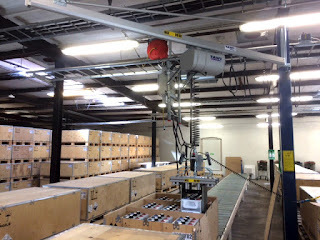 Protema lifting trolley with electrical tiltable arms for crates. This Protema PRO120L is equipped with EasySqueeze and 120 degrees electrical titlable arms for crates. The lifting trolley is designed to lift crates without upper edge. The fact that the crate does not have an upper edge makes it difficult to use a standard fork tool to lift and rotate the crate. Instead, the crate is safely lifted with two electrically tiltable arms that squeeze the crate from both sides. With this electric trolley crates of various sizes can easily be lifted, transported, tilted and emptied without heavy manual handling for the operator. The trolley in this project can lift crates weighing up to 40 kg. 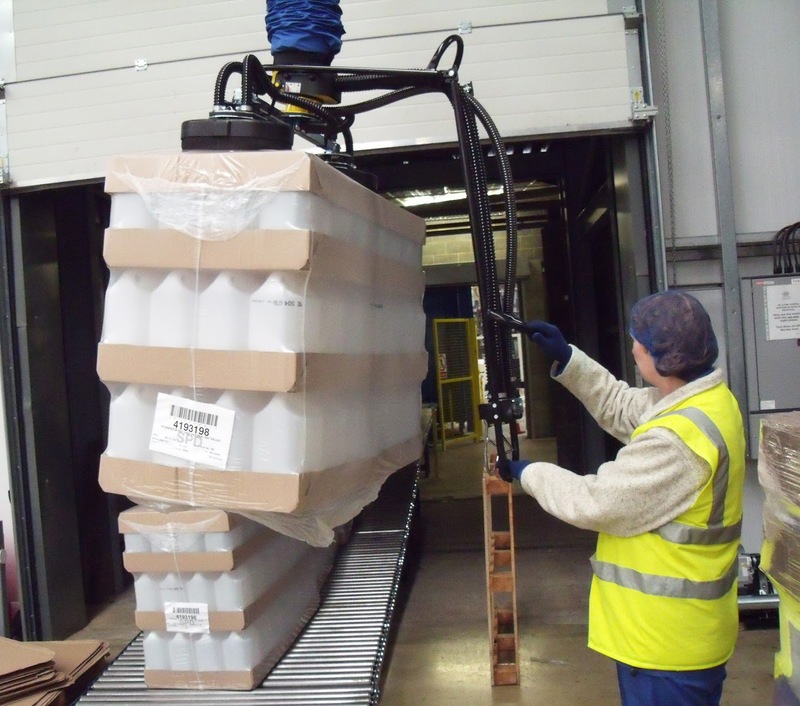 Click here to view video and more information about our different solutions for lifting crates. 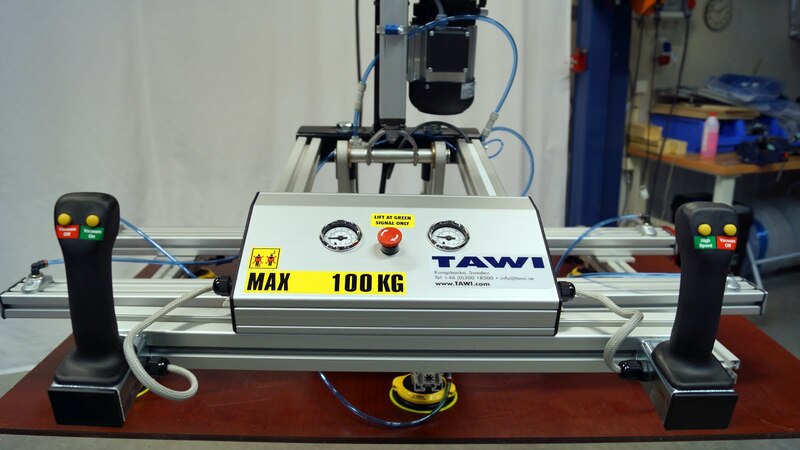 Workplaces with limited operational space and low headroom are no problem for TAWI lifting equipment. For example, Lyftman crane system combined with a telescopic girder can provide an optimal solution. In the project presented on the image below, there was a need to be able to reach and pick up goods inside pallet racks on both sides of the aisle. A telescopic design offer limitless possibilities to reach areas that would otherwise not have been possible to reach due to various obstacles. The telescopic girder was installed under the steel girder. 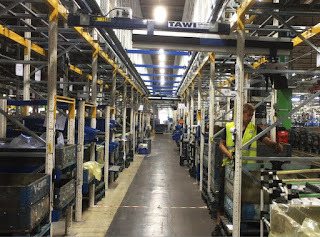 The system was also equipped with a lock function, making the two beams centred in the middle, thus allowing the girder to move along the aisle without colliding with the pallet racks. View video and read more about Lyftman telescopic crane system by clicking here. Another solution for areas with low headroom is Lyftman low built system, you can find more information about all Lyftman crane systems here. In the project above, the telescopic crane system was combined with a hoist. Our latest product edition, ViperHoist wire hoist, offers good ergonomics as well as fast, safe and flexible operation. The ViperHoist can be equipped with a quick coupling which enables great flexibility and the use of any tool on the same hoist. Click here to read more! Manual handling with a lot of carrying and heavy lifting is still common in many work environments. This applies to industries such as packaging, distribution, logistic centres and different manufacturing processes. To reduce the risk of injuries and other long term problems caused by repeated manual lifting, the employer can make some changes to improve the work environment. Good ergonomic does not only reduce the number of health problems, it can also increase productivity and contribute to lower costs for the company. At TAWI ergonomics is in focus when we develop new solutions for our customers and we manufacture products specifically designed to reduce the strain on backs, knees and shoulders. With TAWI products it's easy and safe to lift, move, tilt and rotate loads in all kinds of environments. 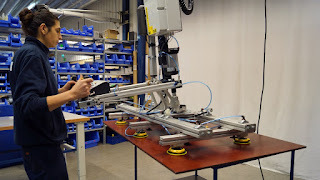 Our ergonomic lifting equipment consists of for example lightweight crane systems, vacuum lifters and electric trolleys. Click here to view a video of how our ergonomic vacuum lift, VacuEasylift, is used by the employees at Systembolaget to lift wine boxes. Read more about ergonomics at the Swedish Work Environment Authority website by clicking here. Lift, move and assemble tyres without heavy manual handling. With Protema tyre lifter you can easily lift and move tyres weighing up to 170 kg. The tyre can be placed directly on the lift, easily transported to the vehicle, lifted to appropriate height and then rotated to the correct position for assembly. The battery operated lift is equipped with special chassis and roll fork with adjustable support rolls. This enables easy rotation and correct positioning during assembling of tyres on trucks and other vehicles. The image shows a lift developed for lifting truck tyres but we have solutions for tyres of various size. To view a video and more information about Protema tyre lifter click here. Read more about different lifting solutions with Protema electric lifting trolleys by clicking here.